One of my Barbara-like hobbies is my beloved allotment and today I took possession of the one thing every parenting allotment-holder needs. No, not a shed. Nor a polytunnel, although it has to be said, one is on the wishlist. What every allotment needs needs is a slide. With the best will in the world, most small children have a very short attention span and it doesn’t take long after arriving at the allotment before they’re off getting into some kind of trouble, or asking to go home. I did find it a lot easier when they were little babies, as they happily slept in the pram while I got on with the work, but as they get older, it becomes more important to keep everyone entertained. 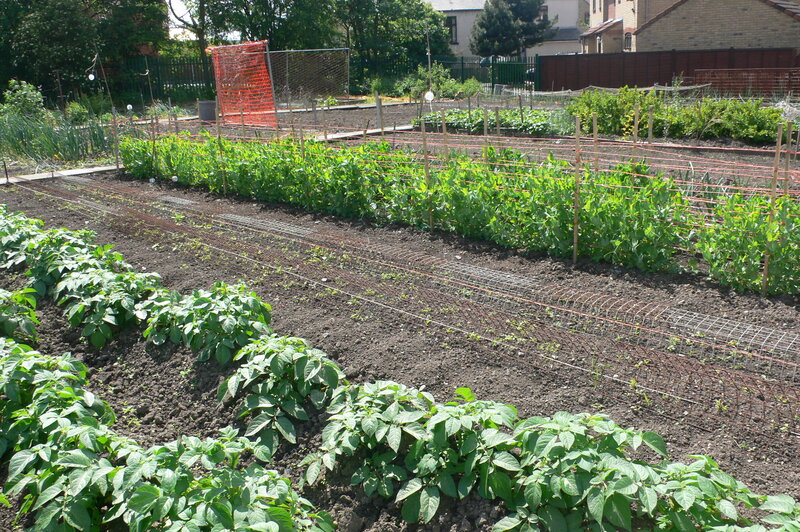 With a bit of planning, the allotment can be a brilliant, fun and educational place to spend time as family. 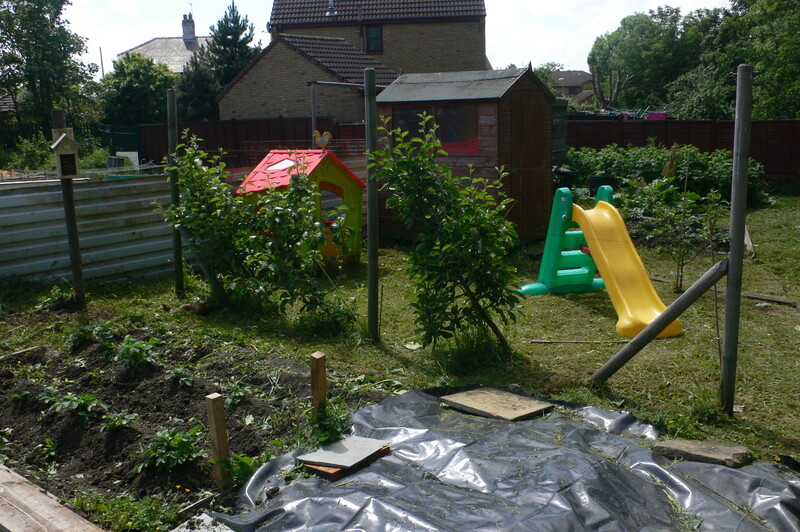 So here are my rules for balancing allotment gardening with small children! Try to have a patch of lawn, for playing and picnics. My local authority even encourage this in their literature. Remember to bring plenty of snacks, drinks, suncream, hats, gloves, wipes, nappies, maybe even a change of clothing, depending on how far away from home your site is. It’ll be worth it. Once they’re old enough, give your kids a patch of their own for growing. Bigger seeds, like potatoes, beans, peas or plug plants are easier for them to handle when they’re little. Let them get involved in what you’re doing, assuming that they’re not going to do themselves harm. I did nearly get hit in the face by Eve wielding a hoe yesterday, so make sure they’re not going to harm you either! Allow for more of a creative approach to planting – fewer military drills, and more scattering. Grow things kids like to grow – sunflowers; fruit; potatoes which are great for digging up like treasure. My children will eat some things straight from the plant like raspberries and peas. Grow things you like to eat. It might sound silly, but there’s no point spending all your time there growing cabbages just because the books tell you it’s part of your crop rotation, if no-one will eat them! Just plan out your spaces a bit differently, and grow what you know you all like. You can manage the crop rotations differently and add plenty of organic matter to the soil to help make up for any imbalances. Never compare your allotment with that of those folk with more time on their hands than you – you’ll just be discouraged. Although, I actually prefer my rather chaotic plot to the regimental rows. 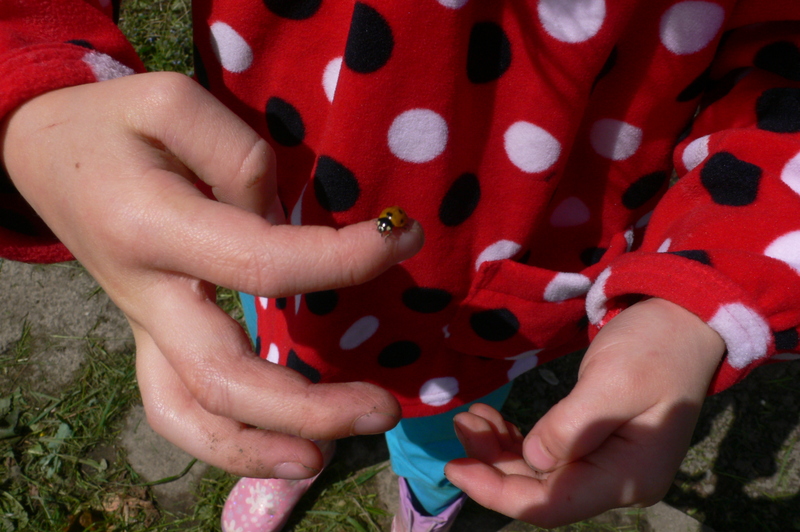 Remember it’s a hobby, so don’t get stressed about it if you end up spending all your time there on a ladybird hunt instead of weeding. Which is what happened to me yesterday. Oh, and ALWAYS ask if they need the loo just before you leave the house, otherwise the minute you open the shed door, you’ll be heading home again! 2 Responses to Allotment Essentials!